I’m a sucker for a fresh from the oven yeast bread and reminds me of the gooey cinnamon rolls my mom would make for Christmas morning. 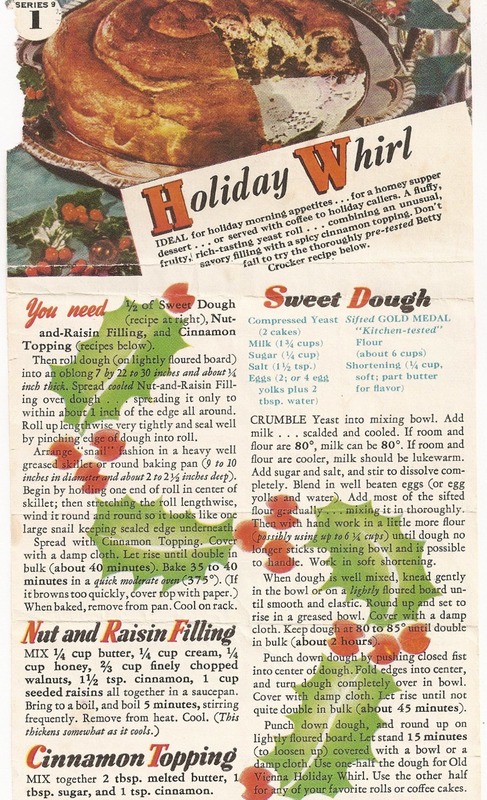 This ‘Holiday Whirl’ vintage recipe uses a light yeast bread which is filled with a cinnamon raisin filling, then topped with a cinnamon topping. Coiled into round shape, the sweet bread makes a delicious dessert for any occasion. The recipe is a promotional insert, likely from a Gold Medal flour bag. The sweet bread has 3 components, the bread dough, raisin filling, and cinnamon topping. And I’m not gonna lie, since the dough takes a few hours to makes, it’s not for the faint hearted. However, I think it’s one of those recipes that is worth every minute you put into it. Crumble yeast into a bowl. Scald and cool the milk. If working in a room that is less than 80F, then milk should be lukewarm. Add milk to yeast, along with sugar and salt. Stir to dissolve. Blend in well beaten eggs. Add flour in small amounts, using hands. Continue adding flour until the dough no longer sticks to the bowl. Work in softened shortening. Punch down the dough and let rise until not quite doubled in size [about 45 minutes]. Use half this dough for the Vienna Holiday Whirl. The remaining dough can be used to make cinnamon sticky buns or other dessert breads. Mix ingredients in a saucepan. bring to a boil and boil 5 minutes, stirring frequently. Remove from heat and cool completely (will thicken somewhat). Using half of the sweet dough recipe above, roll the dough into an oblong shape, 7 x 20 inches and about 1/4 inch thick. Spread with cooled raisin filling to within an inch of the edge all the way around. Roll up lengthwise and seal well, pinching to make sure it’s secure. You will have a long log shape at this point. Starting at one end, coil the dough into a ‘snail’ shape inside a well greased skillet or round baking pan (10 inches diameter). Spread the cinnamon topping over the top and cover with a damp cloth. Allow to rise until double in size [about 40 minutes]. Bake 35-40 minutes in a 375F (190C) oven. When baked, remove from pan and cool on a rack.